With our focus on awareness for childhood cancer, we wanted to bring you some Unique Fund Raising Ideas To Support Your Cause. If you have ever been in a place to be on a the committee at a school or organization to raise money, you know it can be a tough challenge. Whether you are raising money in honor of a loved one, for a school event, church event or for community improvements, there are tons of great options out there for you to consider. With a bit of team work, some organization and dedication to the event or plan, you can find a great way to successfully provide funds for whatever cause is on your heart this year. T-Shirt Sales. With sites like Teespring out there doing all the work for you, it is easy to create a unique and fun shirt to share with your friends, family and others in your community. There is a flat rate per t-shirt then you set your price above that and make the remainder of sales as profit. You can designate the profit from sales to go toward the charity or event of your choice. This is especially great since Teespring will even ship the t-shirt directly to the customer for you! Host A Fair. A small community fair is a great way to raise money for events and causes. Work with your local food and beverage vendors for donations, then ticket and food sales can go directly to the charity or cause you are trying to support. This is perfect for bringing a school, church or small community together to support a local individual or cause. Cupcake Bake Sales. This classic fund raiser has taken on a new twist with the now popular cupcake. Cupcakes are so fun and easy to make unique and sell for up to $5 each at a fund raising event. Basic boxed cake mixes can be made unique with fun additions of candy bars, fruit and juice or soft drinks. This is perfect for a church or school fund raiser that might be able to furnish a great industrial kitchen to make large batches in. Our Outer Space cupcakes are great for fund raisers! Recycling Drives. Put out boxes, bins, trash cans and buckets in your community for items to be recycled and turned in for cash. Aluminium cans are the easiest and most commonly collected that will pay out in cash. Some states also pay back on glass and plastic bottles. This is one of the best unique fund raising ideas because it’s also fantastic for the environment! Arts & Crafts Sales. Everything from kids arts and crafts to professionally made jewelry, hand painted portraits, caricatures and more are great for selling at a fun all day sale or event. Gather the community together to set up booths with their best products and sell with all proceeds going to charity. These are especially great in the Fall near the holiday season. They are perfect for helping others find unique holiday gifts and giving back to a good cause. Poker Tournament. These are such fun unique fund raising ideas and a great way for adults to join together and do something fun for a good cause. Hosting a poker tournament allows you to charge an entry fee that will then be donated to charity. Concessions can be sold for the players and attendees that can also go to support your cause. Speciality Calendar. There are often fun “girls of” or “guys of” calendars for sale at the end of the year. What about making your own unique speciality calendar to sell? There are thousands of themes including great barns of your state, county or city that would be great to sell to anyone! Attractive fire fighters, police officers and emergency personnel are always popular. Think outside the box and look for needs in your community. 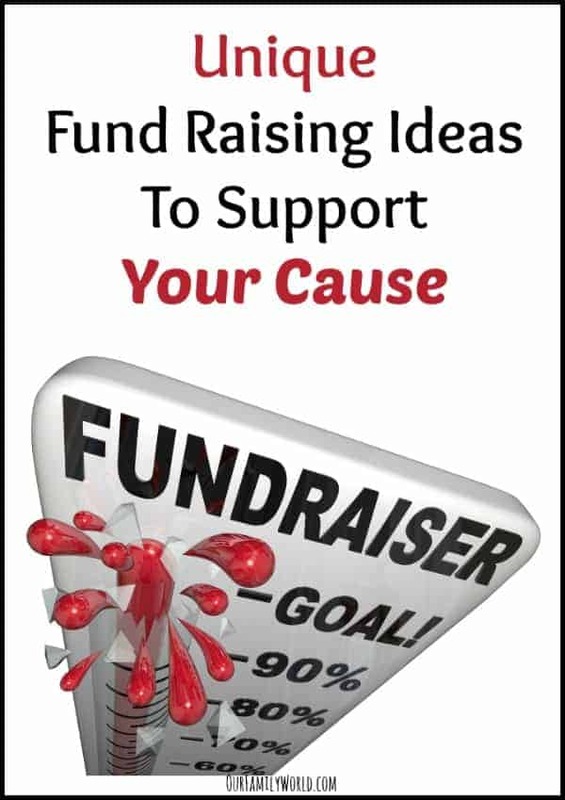 When you find a need or a void in your community, you may have found the next great unique fund raising ideas to support your cause. Whether you are raising money for childhood cancer as we are, or you are raising money for your kids next baseball team event these are great places to begin. Fund raising can be a fun and family friendly experience that teaches everyone to put others first and work hard for a cause. Do you have any unique fund raising ideas to share? Tell us in the comments! Chocolate Bar sales have always gone very well.